The Labour Day weekend event, supporting the NASCAR Camping World series, was the Canadian Touring Car Championship’s second 2016 visit to Canadian Tire Motorsport Park. Drivers would be competing in two 40-minute races around the ten turn 2.459-mile road course. With only one more weekend of racing left after this event teams were under pressure to collect as many points as possible. The first lap of round twelve and the race leader is pole-sitter Bob Attrell in the No. 88 Hyundai Genesis Coupe. Out of view, but behind Attrell in the Fastco Motorsports Ford Mustang Boss 302 is Grand Touring competitor Alex Tagliani. Third and first in the Super Touring category is the BMW 330i of points leader Eric Hochgeschurz. 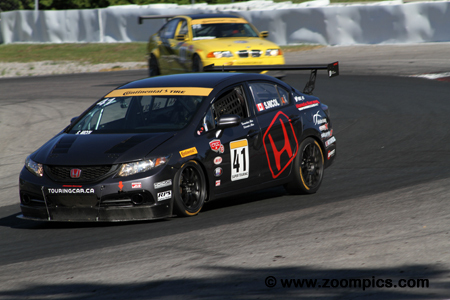 Following Hochgeschurz is the Honda Civic Si of Scot Nicol and Tom Kwok in an Acura CSX Type S.
Point’s leader in the Touring class, Michel Sallenbach won both ends of the double header. In the weekend’s first race, Sallenbach trailed pole-sitter Marlin Langeveldt’s Mazda RX-8 until Langeveldt retired. He was then challenged by Mac Korince but Korince, also failed to finish. The following day, Sallenbach would lead to flag-to-flag and increase his points lead. 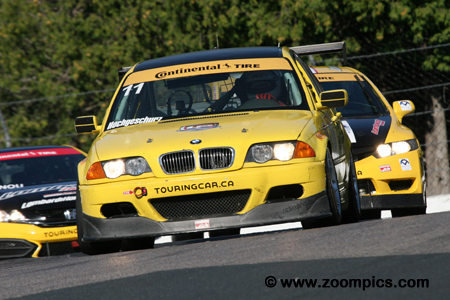 In round twelve, Super Touring championship leader, Eric Hochgeschurz driving the 8Legs BMW 330i jumped to an early class lead. With just five minutes remaining in the forty minute race the car broke an axle leaving Hochgeschurz stranded at Moss corner – he was classified seventh in Super Touring. Despite a low voltage issue with the car in Sunday’s race Hochgeschurz was able to score a victory. 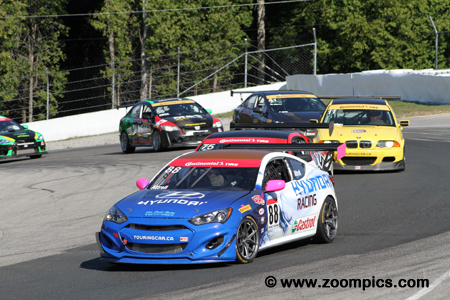 It was a solid weekend for Grand Touring competitor Bob Attrell driving the Blanchet Motorsports Hyundai Genesis Coupe. Attrell started the weekend off by grabbing the overall and class pole position. He was under pressure from Alex Tagliani until Tagliani had an engine sensor failure. From that point on it was ‘clear sailing’. In Sunday’s race, Attrell trailed race leader Gary Kwok for nine laps but made a successful pass for the class and overall victory. Second in the Touring class standings was John Young racing the No. 8 M&S Honda Civic Si. Young had a consistent season with a number of runner-up finishes. In Saturday’s event, he started third but fell to fourth after being passed by Mac Korince. When fastest qualifier, Marlin Langeveldt and second place Korince retired Young inherited the runner-up spot. The following day he started from the pole but was second in Touring at the checkered flag. Scott Nicol drove the No. 41 Velocity Motorsports Club Honda Civic Si. With two events remaining in the 2016 season he was second in the Super Touring standings. Nicol qualified fourth overall and second in class for the weekend’s first race. Running second, he was able to capitalise on Eric Hochgeschurz’s misfortune and take the class win. In the weekend’s second event, Nicol started and finished third. 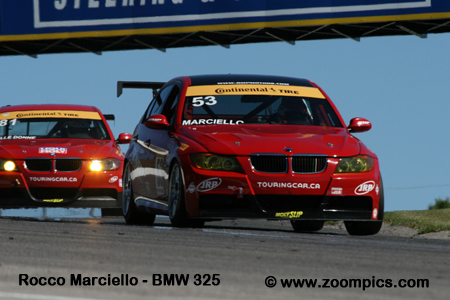 Scoring his best results of the season and out pacing his teammate Rocco Marciello was Michael Delle Donne. 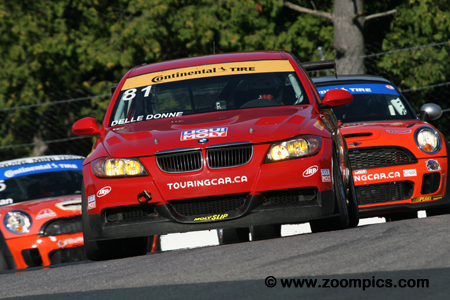 Delle Donne competing in the Super Touring category was gridded fourth in Saturday’s race but with the retirement of race leader, Eric Hochgeschurz and, third place, Tom Kwok he finished second. During Sunday’s event, Delle Donne found himself in a three-way battle with Hochgeschurz and Scott Nicol. At the checkered flag, he was second. Tom Kwok was having a good race during round twelve, chasing the Super Touring leaders Eric Hochgeschurz and Scot Nicol. Unfortunately, for Kwok, it all came to an end on lap-7 when a hub failure caused him to lose his right rear wheel at Moss corner. 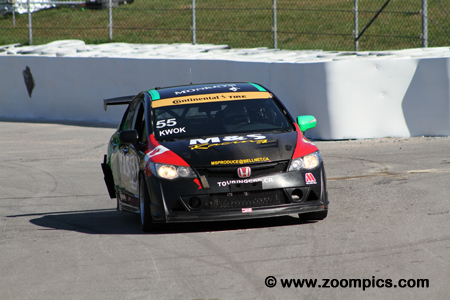 With repairs made for the weekend’s final event, Kwok started and finished fourth in the M&S Racing Acura CSX Type S.
The Grand Touring point’s leader was rookie Chris Sahakian. 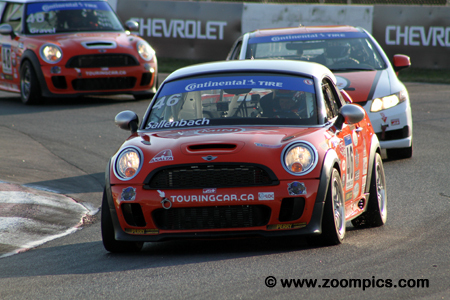 Sahakian had his first win at Shannonville in round seven but his place in the standings could be attributed to consistent finishes. Sahakian did not qualify particularly well in rounds twelve and thirteen – fourth and fifth in class. But when Alex Tagliani and Damon Sharpe encountered issues the driver of the United Auto Racing Ford Mustang earned a pair of third-place finishes. Driving the No. 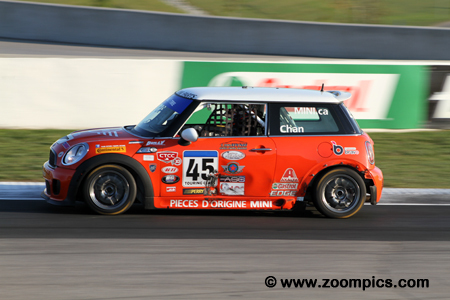 45 Team Octane Mini Cooper S was Nelson Chan. 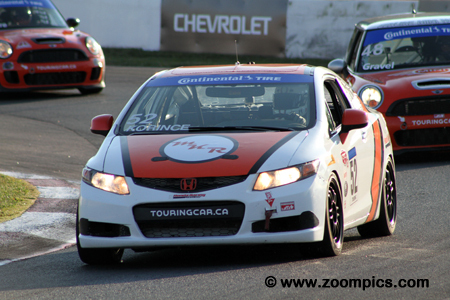 Chan was gridded eighteenth overall and fourth in the Touring category for Saturday’s event. When Marlin Langeveldt and Mac Korince retired he earned the last spot on the podium - to date, this was his best result. In the weekend’s final race Chan started third but was passed by Korince and his teammate Paul Gravel to finish fifth. After failing to record a time during qualifying, the No. 52 Honda Civic Si of Mac Korince started last on the field. At the start, Korince moved through the Touring class and looked set to challenge category leader Michel Sallenbach but retired five laps short of the finish after running out of gas. 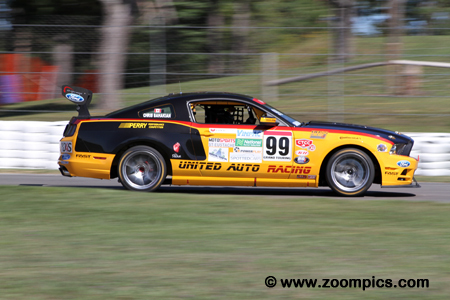 He fared much better on Sunday capturing third in class after a fourth place start. The No. 66 M&S Mitsubishi EVO was raced by Gary Kwok. 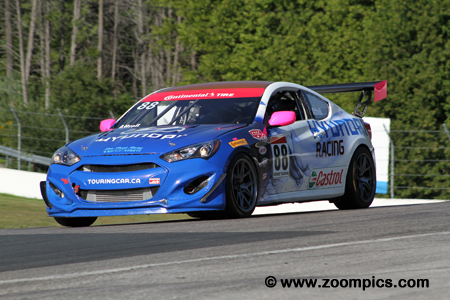 Competing in the Grand Touring category, Kwok started behind Bob Attrell and Alex Tagliani in the weekend’s first race. During the contest, he was passed by the Porsche of Jerimy Daniel and Chris Sahakian in a Mustang – resulting in a fifth. In the weekend’s final event he was gridded sixth overall but on lap-7 moved into the lead. However, on lap-16, Kwok was passed by eventual winner Attrell.